Coleman® patent pending BlackOut Bedrooms™ are a revolutionary new sleep system for campers. Ideal for parents or anyone who is sensitive to daylight. Our patent pending technology blocks up to 99% of daylight penetrating the bedroom - helping you get a longer, more restful sleep! Highly flexible and lightweight fibreglass poles guarantee a good response to wind and storms. Coleman patent pending BlackOut Bedrooms™ are designed to be morespacious than the average tent bedroom***. Comfortably accommodating our larger double air beds, they offer plenty of space to make your camping trip more enjoyable and helping you get a great night sleep, in the great outdoors! Keep your bedroom up to 5°C cooler during the day and up to 1°C warmer during the night Coleman® patent pending BlackOut Bedroom® helps you to manage the temperature in your bedroom by storing energy from the sun in the surface of the fabric. A tent’s waterproof properties are measured using a rating called its hydrostatic head. If a tent has a hydrostatic head of 3000/4000mm*, it can hold a 3/4 metre* column of water on its surface before any leaks through. The Ministry of Defence UK classifies a hydrostatic head of 800mm as waterproof. Coleman® uses polyethylene (PE) groundsheets which are relatively heavy but provide guaranteed water protection. 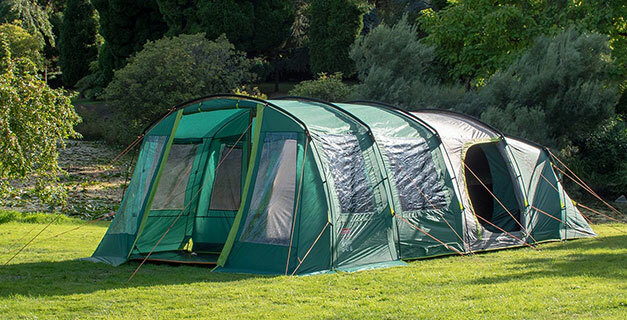 PE groundsheets are ideal for family and active tents where a very light weight and small pack size are not essential. The fire retardant characteristic of our material ensures that the fabric will not flare dangerously out of control and will selfextinguish, giving time to escape in the event of an emergency.